Pictured from left are Alex Mendoza, a senior at Artesia High School (AHS); Ken Clayton, president of Western Bank; and Christine Villa, a senior at AHS. 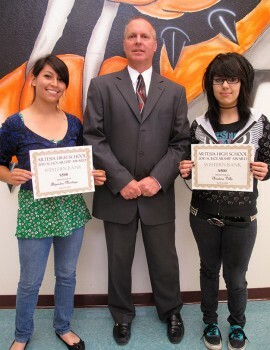 Mendoza and Villa each received a $500 scholarship from Western Bank. “Our decision to award scholarships to these young women was based on their grades and also their desire to go to college and do something good,” said Clayton. Villa has chosen to attend New Mexico State University (NMSU) and plans to major in industrial engineering. Mendoza said she is torn between Texas Tech and NMSU. She plans to major in international business.